The Yellowhammer remains a widespread farmland bird in the UK but its numbers have declined sharply since the 1980s, to the extent that it is now red-listed as a Bird of Conservation Concern. 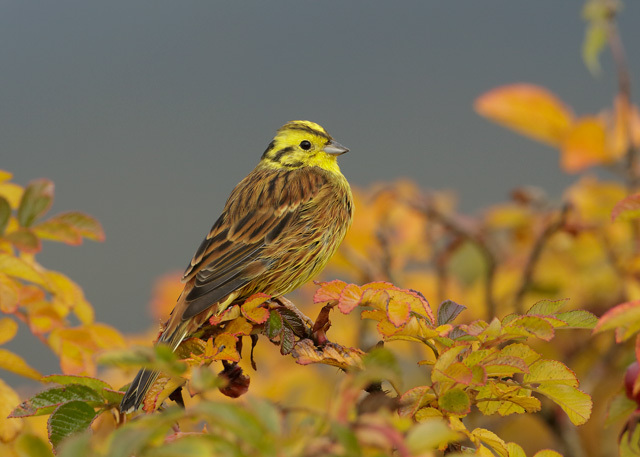 Thus, it is no surprise that the species is the focus of conservation attention such as that through Northern Ireland's Yellowhammer Recovery Project. However, Yellowhammers are not only of interest for conservationists. By the early 20th century ornithologists had noticed that these birds, like a number of familiar British birds, have dialects. If you listen to their song carefully, you will notice that they do not sound identical in different regions. This is particularly noticeable in Central Europe but even within the UK there is substantial variation in Yellowhammers' songs: this did not escape attention of the prominent British evolutionary biologist, Sir Julian S. Huxley, in the 1940s. Studies of bird dialects may contribute to research of the cultural evolution of vocal communication but also inform other area of ecological research such as invasion and landscape ecology. However, such research often requires a large amount of data from vast geographic areas, which can be too costly and time-consuming to obtain. That's where involvement of public in research through citizen science projects may be particularly helpful, especially if the target species is as easy to recognize and record as the Yellowhammer. Yellowhammer males are relentless singers; they sing from sunrise to sunset throughout the spring and summer. Their song is simple and an experienced listener can distinguish basic dialects, differing in the final part of the song, even by ear (see below). So far over 10 basic dialects, often distributed in a mosaic fashion, have been identified in Europe but detailed knowledge is available from a few regions only: Denmark, part of Germany, and the Czech Republic. In 2011 the Czech Ornithological Society promoted the Yellowhammer as their "Bird of the Year", and launched a citizen science project "Dialects of Czech Yellowhammers" that became a great success. With increased knowledge on dialect distribution in local to regional scales, many interesting questions have arisen: which factors ensure the long-term maintenance of dialects? Do the boundaries between neighbouring dialects follow habitat boundaries, or are social interactions more important? How do dialects evolve in newly established areas? To answer the last question, the Yellowhammer Dialects Project, to which you may contribute, has been launched. Yellowhammer dialects in the Czech Republic (Adam Petrusek & Mark Eaton). While the British Yellowhammer populations are struggling, there is another region in the world where the birds of British origin thrive: they were introduced to New Zealand in the late 19th century, and rapidly spread across the country to become a serious agricultural pest a century ago. This "natural experiment" provides an opportunity to study the evolution of Yellowhammer dialects during colonisation, and comparing distributions of dialects in the donor (UK) and colonised (NZ) country may allow reconstructing the spread of bird "cultures" across a new territory. However, such research cannot succeed without the help of volunteers from both countries, and both the Royal Forest and Bird Protection Society of New Zealand and the RSPB are encouraging observers to take part in this novel and exciting project. Hopefully, the involvement of British birdwatchers may not only contribute to research but also get Yellowhammers the attention they deserve. If you would like to get involved in recording Yellowhammer songs for the project, you don't need any sophisticated equipment or specialised knowledge. Actually, many modern mobile phones, digital cameras or voice recorders can record in a sufficient quality to allow dialect identification. Just follow simple instructions at the project's website, get into the field, record your local male Yellowhammer... and spread the word about the project!